Developmental dysplasia of the hip (DDH) is a condition where the "ball and socket" joint of the hip does not properly form in babies and young children. It's sometimes called congenital hip dislocation or hip dysplasia. The hip joint attaches the thigh bone (femur) to the pelvis. The top of the femur (femoral head) is rounded, like a ball, and sits inside the cup-shaped hip socket. In DDH, the socket of the hip is too shallow and the femoral head is not held tightly in place, so the hip joint is loose. In severe cases, the femur can come out of the socket (dislocate). DDH may affect one or both hips, but it's more common in the left hip. It's also more common in girls and firstborn children. About 1 or 2 in every 1,000 babies have DDH that needs treating. With early diagnosis and treatment, most children are able to develop normally and have a full range of movement in their hip. Within 72 hours of giving birth, your baby's hips will be checked as part of the newborn physical examination. Another hip examination is carried out when your baby is between 6 and 8 weeks old. The examination involves gentle manipulation of your baby's hip joints to check if there are any problems. It should not cause them any discomfort. Sometimes a baby's hip stabilises on its own before the scan is due. 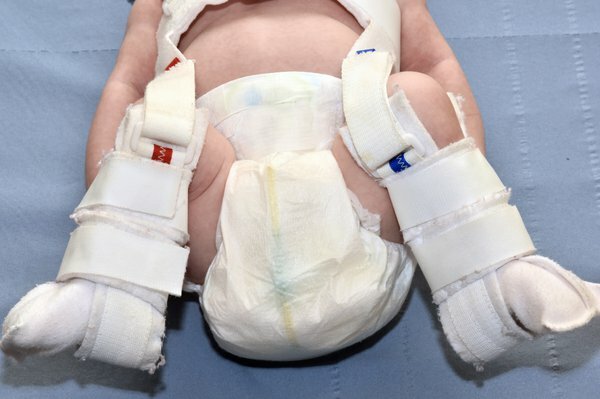 Babies diagnosed with DDH early in life are usually treated with a fabric splint called a "Pavlik harness". This secures both of your baby's hips in a stable position and allows them to develop normally. The harness needs to be worn constantly for several weeks and should not be removed by anyone except a health professional. The harness may be adjusted during follow-up appointments, and your clinician will discuss your baby's progress with you. Eventually, you may be given advice on removing and replacing the harness for short periods of time until it can be permanently removed. You'll be encouraged to allow your baby to move freely when the harness is off. Swimming is often recommended. Surgery may be needed if your baby is diagnosed with DDH after they're 6 months old, or if the Pavlik harness has not worked. The most common surgical technique is called reduction – this involves placing the ball of the femur back into the hip socket. Your child will need a hip cast for at least 6 weeks after surgery. Their hip will need to be checked under general anaesthetic again after this to make sure it's stable and healing well. After this investigation, a cast will probably be needed for at least another 6 weeks to allow the hip to fully stabilise. Some children may also require bone surgery (osteotomy) during an open reduction, or at a later date, to correct any bone deformities. The newborn physical examination, and the check at 6 to 8 weeks, aims to diagnose DDH early. However, sometimes hip problems can develop after these. Your child will be referred to an orthopaedic specialist in hospital for an ultrasound scan or an X-ray if your doctor thinks there's a problem with their hip. It's important to remember DDH cannot be prevented and is nobody's fault. A baby's hips are naturally more flexible for a short period after birth. However, if your baby spends a lot of time tightly wrapped with their legs straight and pressed together (swaddled), there's a risk this may slow their hip development. Using "hip-healthy" swaddling techniques can reduce this risk. Make sure your baby is able to move their hips and knees freely to kick. You can read about hip-healthy swaddling on The International Hip Dysplasia Institute website.